Since his career began, Borussia Dortmund's Gabonese forward Pierre-Emerick Aubameyang has been impressing. Though raised in France, the 2016 BBC African Footballer of the Year nominee, 27, was on the books of Italian side AC Milan - for whom he never played - when loaned to French side Dijon. And in his first game, a pre-season friendly in 2008, the then 18-year-old wowed his seniors. "When you play that first friendly of the season you're not yet ready, but without being ready, he was already better and quicker than the others," said Florent Perraud, who was Dijon's goalkeeper at the time. "On the pitch, we were saying, 'What is this kid? He's an extra-terrestrial who has been given to us'. "We realised we hadn't just got ourselves a young kid, but a phenomenon." Ten goals in Aubameyang's maiden professional season followed. Then began a suitably peripatetic journey for a youngster raised in France, Colombia, Italy and Mexico (as he followed his footballing father Pierre) as loan moves to Lille, Monaco and Saint-Etienne preceded a permanent move to the latter in 2011, whereupon his game started coming together. From there, a 2013 switch to Borussia Dortmund accelerated his path to becoming one of the planet's best forwards. In June 2016, he became the first African to be named Bundesliga Player of the Year - an award voted for by fellow professionals. His form has also earned 'Auba', who is the first Gabonese to become the Confederation of African Football's Player of the Year, a place on the shortlist for the 2016 Ballon d'Or. He's primarily known for his goals - 11 in nine Bundesliga games this season, including four in a 5-2 win over Hamburg - and 89 from 152 in total for Dortmund. There's also his pace, which has earned comparison with Usain Bolt over a short distance, and celebrations, with Aubameyang having donned Batman and Spiderman masks after scoring. "He liked to joke around and make people laugh - a really funny guy and really good company," said Jordan Loties, a former Dijon team-mate. With his celebratory somersaults, flamboyant clothing and extravagant haircuts, Aubameyang is quite the showman - even if he describes himself as shy. 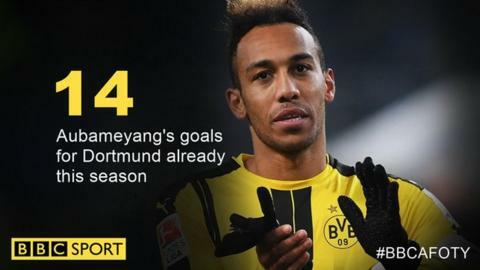 "I have worked enormously hard to improve," Aubameyang told BBC Sport. A football-mad youngster, who recreated toy stadiums in his bedroom before representing France at junior level, Aubameyang followed his father by captaining the Gabonese 'Panthers'. "I chose Gabon to represent Africa and be a successor to Didier Drogba and Samuel Eto'o," he said. "But to do that, you have to win prizes." With an array already, will the BBC award be added to his cabinet?